14 year old Boxer With Dementia Keeps Going Strong! Sophie, our sweet boxer, is now 14 years old. Boxers generally only live 8 - 10 years.Thanks to Ask Ariel's Brain Vitale and diet program, Sophie is going strong physically and mentally. 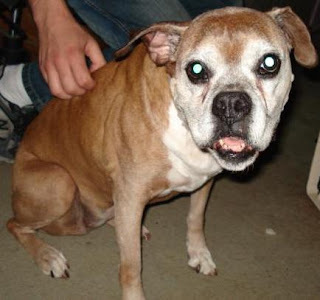 As many senior dogs do, Sophie had developed pancreatitis and was having digestive issues; she did not want to eat. Susan Davis, Ask Ariel Nutritionist, formulated a low fat diet for Sophie and recommended using the supplements, K9 Digestive Enzymes and Lypozyme. Sophie no longer has pancreatitis and she is back to chowing down her meals. The K9 Digestive enzymes stopped her tummy rumbling and the Lypozyme cleared up her pancreatitis. As Sophie got older, she started to bark and bark for no reason. It seemed like she had dementia which affects some senior dogs. She seemed to not even know that she was barking. Susan recommended the supplement Brain Vitale for healthy brain function and we got our Sophie back. She is back to her old self, playing with our other boxer, and the barking has all but stopped. Nothing helped with the doggie dementia until we started using the Brain Vitale. It made a big difference in her temperament and energy level. We know that we would not have our senior dog, Sophie with us today if is wasn't for Ask Ariel's help with Sophie's diet and supplements.